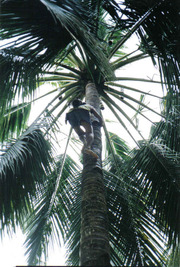 Pollachi in southern India is considered coconut belt. There are several thousand acres of coconut plantation in pollachi. The main livelihood of farmers here is coconut. But due to fluctuating market price and low yield due to drought farmers are struggling. There is no fixed government price for coconut nuts from which oil is extracted. Recently due to the efforts of Kongu Peravai, a newly formed political party in the Kongunadu region farmers are extracting toddy - an low alcoholic beverage. Though it is banned by the government farmers are engaged in the act. They earn good money nowadays by selling at 40 rupees a liter. In parts of India, the unfermented sap is called "Neera" ("Padaneer" in Tamil Nadu) and is refrigerated, stored and distributed by semi-government agencies. A little lime is added to the sap to prevent it from fermenting. Neera is said to contain many nutrients including potash. Palm toddy also forms the base for a drink popular in Goa, known as Goan Feni. Palm sap begins fermenting immediately after collection, due to natural yeasts in the air (often spurred by residual yeast left in the collecting container). Within two hours, fermentation yields an aromatic wine of up to 4% alcohol content, mildly intoxicating and sweet. The wine may be allowed to ferment longer, up to a day, to yield a stronger, more sour and acidic taste, which some people prefer. Longer fermentation produces vinegar instead of stronger wine. Tamil Sangam literature contains many references to Toddy (Kallu) and Tirukkuṛaḷ contains a chapter on "Abhorrence of Toddy".